When you think of "Bible pictures," do you visualize in your mind the pictures that your Sunday school teacher used when you were a child? Times have changed and now there is such a variety of visual tools that can enhance Sunday School lessons, Bible study lessons, Children's Church and sermons. 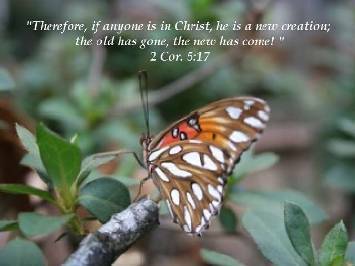 Try the following Photo Bible lessons, Christian videos, and links to sites that offer free Bible photos, and printable coloring sheets that are appropriate for teaching Bible lessons to preschoolers, children, youth and adults. These can be used as tools for Sunday School, Homeschooling, Sermon PowerPoints, or really any Bible teaching opportunities. God has given me a love for photography and a love for His Word; therefore, "Photo Bible Lessons" is my way of putting the two of these together. They say "a picture is worth a thousand words," then a picture that can depict the truth of God's Word speaks even more! These are photos & images that can be used to teach a Bible lesson that will be able to impact through a visual element. They are similar in layout to our Christian object lessons, but will use the Bible pictures in place of an actual object. Again - we can be creative in teaching God's Word through everyday opportunities in the things we see. 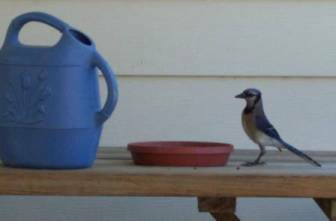 Photos of a bluejay eating out of the cat's food dish shouts "Beware of temptation!" Watching hummingbirds fight over drinking from the feeder caused me to think of how selfish we can be at times. In Acts 20:35 Luke quotes Jesus as teaching - "It is more blessed to give than to receive." So many times in the Bible we are instructed to seek His face. Psalm 105:4 "Look to the LORD and his strength; seek his face always." 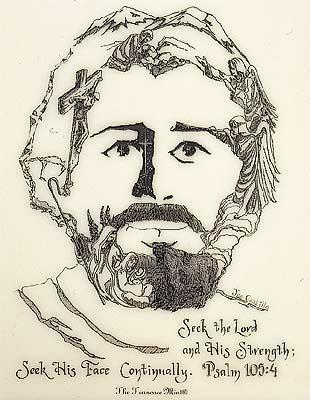 This beautiful pen and ink drawing of the face of Christ by Joe Castillo contains the story of Jesus' life, death, and resurrection! Heartlight offers beautiful Bible images in the form of PowerPoint backgrounds for sermons or Bible lessons, Scripture wallpaper and Ecards. All are free! They also offer free inspiring Scripture pictures - photos with a Scripture overlay. If you're needing Bible pictures of locations in Israel, Egypt, or Rome, FreeStockPhotos.com is the place to look. They also offer inspiring photos of scenery, animals and Christian symbols. TeacherHelp.org offers many Bible verses to color including The Ten Commandments, The Beatitudes, The Lord's Prayer, and key verses including John 3:16. Ministry-for-Children offers a different coloring page for every book of the Old Testament and New Testament as an overview of each book of the Bible for kids. For younger children and preschool Bible lessons, here are some simple Bible coloring pages. Checkout this inspiring drama presentation done with white gloves & black lights. 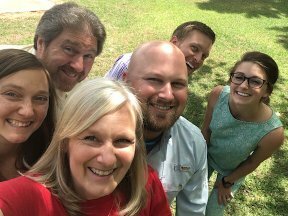 It's done to Casting Crowns' "Who Am I," and is truly amazing!!! Instead of an ordinary Bible image, this Christian video could be used in a Bible study lesson on God's light shining in the darkness or us as Christians letting God's light shine through us. Matthew 5:16 says: "In the same way, let your light shine before men, that they may see your good deeds and praise your Father in heaven." God truly desires to use each of us in unique ways for His kingdom. Just as the song says: it's not about who I am, but about who God is. Who am I? I am God's child because of who He is and what He's done. How about you? Has His love changed you? Turn your laptop computer screen into a puppet stage for your Bible students! There is just something about puppets that capture children's attention, but we may not all have access to puppets, a stage or even the people to work with them; so these are the next best thing! Take a look at the following Christian puppet skits that teach wonderful lessons about God's Word! Bible pictures not only add an extra creative aspect to any lesson, but they also help a lesson to be remembered longer by stimulating our sense of vision!